Preheat oven to 400F. Spray mini muffin pans very well with floured cooking spray, or grease and flour the pans; set aside. If keeping gluten-free, simply use cooking spray or grease the pan. To the canister of a blender, add the banana, egg, almond butter, honey, vanilla, baking soda, baking powder, and blend on high speed until smoothy and creamy, about 1 minute. Add the blueberries and stir in by hand. Work quickly and don’t overmix as blueberries have a tendency to ‘stain’ batters. 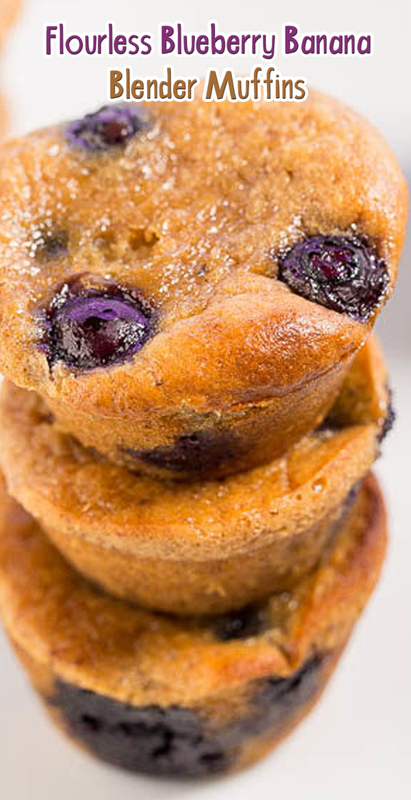 Using a tablespoon or small cookie scoop, add 1 rounded tablespoon of batter to each muffin pan cavity, filling to 3/4 full. Bake for about 12 minutes, or until the tops are set, domed, springy to the touch, and a toothpick inserted into the center comes out clean, or with a few moist crumbs, but no batter. If using fresh blueberries, you’ll likely need to reduce baking time since batter won’t be as cold going into the oven. Due to their small size, and oven and muffin pan variances, watch your muffins closely and bake until done. Allow muffins to cool in pans for about 10 minutes, or until they’ve firmed up and are cool enough to handle. Muffins will sink slightly as they cool.